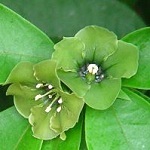 The name 'emerald flower' is not an official one, this plant doesn't have an English name. It is a rarity from tropical Mexico, a small tree with beautiful green flowers of 2-3 cm, included here because of their surprisingly unpleasant smell (sour cheese, Danish type!). The Botanic Garden in Copenhagen harbours a specimen and informs that the flowers smell of butanoic acid. However, other lower aliphatic carboxylic acids are evidently present. central and western China where the summers are long, warm and dry and the winters are mild and snowy. It grows on steep slopes and in open valleys and bursts into a cloud of delicately purple foxglove-shaped flowers before foliation. The leaves become large and heart-shaped. On young growth they may reach more than 50 cm! In China it was an old custom to plant an Empress Tree when a girl was born. The fast-growing tree matured when she did. When she was ready to get married the tree was cut down and made into wooden articles for her gift. The tree was introduced to Europe around 1840 and is commonly seen in the wine-growing countries. It may survive in southern Scandinavia too - the above photos are from the park of Sofiero north of Helsingborg, Sweden. 1,4-dimethoxybenzene (or hydroquinone dimethyl ether) . 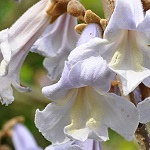 Etymology: Paulownia, named after Princess Anna Pavlovna/Paulowna (1795-1865), the daughter of the Russian Tsar Paul I; Lat. tomentosa, hairy. 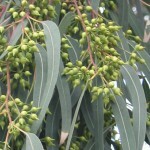 The large genus Eucalyptus includes some 600 species. 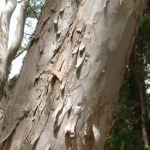 Most of them are native to Australia, where eucalyptus dominates as the forest tree. Several species are planted and spread through sub-tropic regions around the world, e.g. in the Mediterranean countries. Malaria was extinguished from the swampy Paludi Pontine region near Rome through plantation with Tasmanian blue gum. The word malaria is Italian (mala aria) for 'bad air'. Originally it was believed that the disease was caused by the foul smell from the swamps. The fragrant eucalyptus trees should freshen the air. Today, the beneficial effect is explained by a reduction of the mosquitos transferring the disease. The water-demanding eucalyptus trees partly dried out the swamps, and the essential oil of the fallen leaves possibly hampered the development of the mosquito's larvae. Tasmanian blue gum is a fast-growing, large tree making a good shadow. The peeling bark makes the white stem appear. The blue-green leaves are dimorphic. On young shoots they are oval whereas on mature branches they are characteristically sickle-shaped. The yellow-white flowers consist of filaments only. 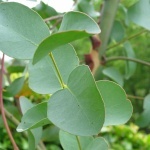 The leaves contain the well known eucalyptus oil, used in lozenges, tooth-paste, etc. 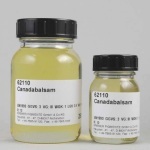 Its main constituent is 1,8-cineole or eucalyptol (ca. 65 %), having a fresh and slightly camphoraceous odour. 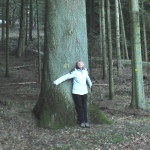 Moreover, the oil is rich in alpha-pinene (> 15 %) . 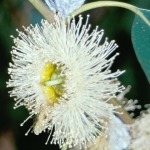 The essential oil from another eucalyptus, E. citriodora, is utilized as a source of citronellal (> 70 %). 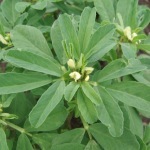 Fenugreek, somewhat resembling sweetclover and lucerne (alfalfa), is a sub-tropical member of the pea family. It has been cultivated since Antiquity for its seeds, being one of the main ingredients of the mixed spice curry. 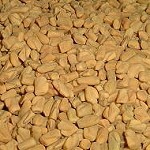 Moreover, the seeds have interesting medicinal properties. The characteristic irregular, brick-red seeds have no essential oil. 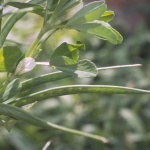 Their flavour is due to trace amounts of the extremely powerful odorant 4,5-dimethyl-3-hydroxy-2[5H]-furanone, also called fenugreek lactone or sotolone . Its odour detection threshold in water is as low as 0.001 ppb, meaning that 1 g of this compound dissolved in one million tonnes of water can be perceived! It has a celery and maple syrup-like odour. It belongs to the group of very powerful 'burnt sugar' odorants, characterized as being cyclic C6-alpha-enol-carbonyls. Etymology: Gr. trigonon, triangle, because of the shape of the flowers; Lat. foenum-graecum, Greek hay, because this plant is used as an additive to hay in Greece. Horses and cattle love it. The Chrysanthemums are highly odoriferous plants. 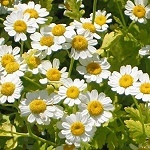 The charming feverfew, a 20-60 cm high perennial bushy herb with light-green leaves and plenty of small daisy-like flowers is one example (now placed in genus Tanacetum). Probably originating in the Asia Minor region it has been in culture since ancient times as a medicinal plant. 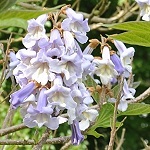 It also thrives well in temperate gardens and comes in a number of ornamental varieties. The whole plant gives off a strong scent when touched, an unmistakable camphor note being present under the sweetish bitter-herbal odor. 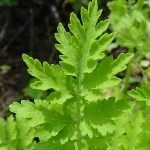 Different chemotypes of feverfew exist but typical main components of the essential oil are camphene, camphor and chrysanthenyl acetate  . parthenolide, which is especially abundant in the flower heads, is held responsible for this biological activity . Moreover, parthenolide seems to express multiple anti-cancer and anti-inflammatory activities . Etymology: Tanacetum, the genus of tansy (Tanacetum vulgare), from Gr. athanatos, immortal, so called probably because of tansy's persistence; parthenium, from Gr. parthenos, virgin, probably from feverfew's ancient use against women's diseases. Chrysanthemum, from Gr. khrusos, gold, and Gr. anthemom, flower, probably used for one or more species with yellow flowers from Southern Europe. 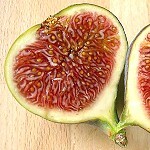 The figs (the genus Ficus) include more than 1000 species, all of them tree-like, with milky sap in stalks and leaves. Their inflorescense and pollination by tiny gall-wasps is one of nature's miracles. 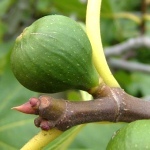 Common fig is a native to southwest Asia and the eastern Mediterranean region. It grows to a large shrub or a small tree with smooth grey bark and deeply lobed leaves with three or five lobes. The fruits (the swollen receptacles with seeds) are mostly eaten dried as the fresh figs don't keep well. Fig leaves have a characteristic sweet-green fragrance, perceptible when one stands close to the sun-warm trees or by handling the leaves. They have been extracted on a limited scale for perfumery use in Grasse in southern France. According to Arctander, fig leaf absolute is a dark green to brownish green, semi-solid mass or viscous liquid of a delicately sweet-green, herbaceous and somewhat woody odour with a mossy undertone. Roman Kaiser, among 200 identified constituents of fig leaf absolute, found a number of olfactorily relevant N-containing trace constituents, one of them 2-isobutyl-4-methylpyridine, characterized by an attractive tobacco-like, green, herbaceous odor. Major odorants were linalool, benzyl acetate, methyl salicylate, beta-ionone and (Z)-3-hexenyl benzoate . Buttery et al. 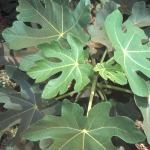 identified germacrene D as a major volatile component in fig leaves. Other major volatiles were beta-cyclocitral, (Z)-3-hexenol and (Z)-3-hexenyl acetate . Stemone ® (Givaudan), belonging to the palette of green-smelling odorants, has an odour somewhat reminiscent of that of fig leaves. 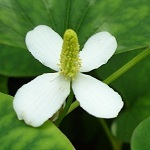 It is used as a modifier for green notes in perfumery. 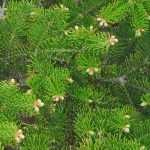 Several fir needle oils are used in perfumery for their fresh coniferous odors, those of the named species are the most popular. They all contain (-)-bornyl acetate as a characteristic component. Other main constituents are monoterpene hydrocarbons such as alpha- and beta-pinene, limonene, 3-carene, and alpha- and beta-phellandrene . (-)-ambroxide or ambrox   . 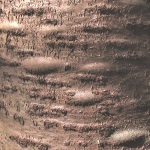 The presence of abienol in several species of fir thus explains why their chopped bark, often used as a bark mulch coverage in parks, etc., sometimes smells characteristically of ambroxide - possibly liberated in trace quantities from microbial activity (the odor threshold of ambroxide is stated to be about 0.3 ppb ). One more fir should be mentioned, the greatest of them all. 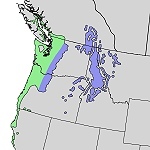 Giant Fir is native to northwestern America (Oregon, Washington, Idaho - the habitats are in blue and green on the small map) but nowadays it is cultured many places around the world. In the Californian coastal area it reaches a magnificent height of 90 m. In Denmark the highest specimens of "Grandis" are about 45 m, some of them can be admired near Gyldenloeveshoej, central Zealand (photo). 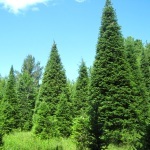 Young trees have long and shiny green needles and are used as ornamentals and as a source of Christmas greenery. 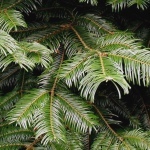 The fresh needles of Giant Fir give off a delightful scent when broken, a bright and rich citrusy (grapefruit-like) green-resinous odor. Adams, Kauffmann and Callahan (2015) analyzed the essential oil and found that among 95 compounds identified, beta-pinene, bornyl acetate, beta-phellandrene and camphene were quantitatively dominating . Fishwort, the only species of this genus, has its natural distribution from India through Indochina and Taiwan to Japan. 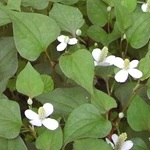 It grows in moist shady places and is sometimes a troublesome weed in its native countries. In temperate gardens Houttuynia varieties may be used as a ground cover. 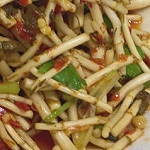 It is used as a vegetable in Vietnam and southwestern China. The photo on the right shows a meal prepared from Houttuynia roots. Houttuynia has an strong metallic or fishy smell when crushed. It is claimed that the presence of 3-oxo-dodecanal is the cause  . However, considering the number of pyridine alkaloids also present  - a typical example being 3-decanoyl-6-nonylpyridine as shown above - some hitherto undetected low-molecular pyridine derivates might be playing a role too. heart-shaped leaves. Lat. Saururaceae, from Lat. saurus, lizard, because the flowers of this family are in terminal lizard tail-like spikes (the white leaves of Houttuynia are bracts). The genus Plumeria includes 7-8 species native to tropical and subtropical America. A lot of cultivars are now spread to most tropical areas around the world. 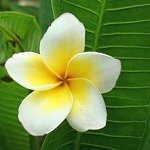 Plumeria is related to the Oleander, Nerium oleander. 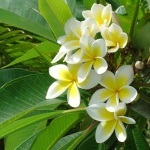 The nectarless Plumeria flowers are most fragrant in the evening in order to lure sphinx moths to pollinate them. The common form of frangipani found in coastal areas with acuminate lime green leaves and medium sized, powerfully lemon-scented white flowers with a large yellow centre is P. rubra var. acutifolia (P. acuminata). Some important odorants from P. acuminata are shown above, (left) nerolidol, citral and neryl phenylacetate, (right) phenethyl alcohol, phenylacetaldehyde and benzyl salicylate  . Charles Plumier. Frangipani, the name of an Italian noble family. The Indonesian name is Kembodja.